Summary: Pretruncal (perimesencephalic) nonaneurysmal hemorrhage is a benign form of subarachnoid hemorrhage (SAH). Angiographic changes of vasospasm are uncommon in patients with this type of hemorrhage, and if vasospasm is present, it is mild and focal. We report two patients with pretruncal nonaneurysmal SAH who developed severe and diffuse vasospasm, expanding the clinical spectrum of this type of SAH. The first patient was a 40-year-old woman who suffered pretruncal nonaneurysmal SAH. Angiography performed on the seventh day post hemorrhage showed diffuse and severe vasospasm affecting both the anterior and the posterior circulation. The patient was treated with hypervolemia, and she remained asymptomatic. Follow-up angiography showed resolution of the vaso-spasm. The second patient was a 67-year-old woman who suffered pretruncal nonaneurysmal SAH. The results of the initial angiography were normal. Repeat angiography on the ninth day post hemorrhage showed severe vasospasm in the anterior circulation and moderate vasospasm in the posterior circulation. Nine hours later, the patient developed transient dysphasia, and she was treated with hypervolemia. Three days later, a transcranial Doppler examination showed normalization of blood velocities. The presence of diffuse and severe vasospasm does not exclude a diagnosis of pretruncal nonaneurysmal SAH. Approximately one of six patients with spontaneous subarachnoid hemorrhage (SAH) has normal angiographic results and an unidentified source of bleeding. The evaluation and management of this group of patients remain subjects of considerable controversy. Several studies have now shown that patients with focal SAH in front of the brain stem typically have normal angiographic results, do not rebleed, and have an excellent prognosis (1–7). The center of such hemorrhages was noted around the mesencephalon on early generation CT scans with poor resolution of the posterior fossa, and the term perimesencephalic nonaneurysmal SAH was suggested (6). With improved imaging, particularly MR imaging, it became apparent that the center of the hemorrhage is anterior to the brain stem (truncus cerebri), and the term pretruncal nonaneurysmal SAH has been suggested to describe this type of SAH accurately (8). One of the distinguishing features of pretruncal nonaneurysmal SAH is the uncommon occurrence of cerebral vasospasm (1–7). This has been tentatively linked to the small amount of hemorrhage in this condition. Diffuse and severe vasospasm has not been reported as occurring in these patients. We recently treated two patients with pretruncal nonaneurysmal SAH who developed diffuse and severe vasospasm. A 40-year-old woman experienced an acute severe headache while bending over in the shower. The next day, she visited a local emergency department where the results of her examination reportedly were normal. A CT scan of the head was interpreted as normal, but in retrospect, it did show a small amount of blood in the prepontine cistern (Fig 1A). A drug screen was negative. The headache persisted, and neck pain, photophobia, nausea, and vomiting developed. Four days after the onset of headache, the results of an examination conducted in our emergency department were normal except for nuchal rigidity. The patient's medical history was significant for alcohol, cigarette, and substance abuse. The patient reported that she had used cocaine until 8 years previously, crystal methamphetamine until 11 months previously, and alcohol and cigarettes until 4 months previously, at which time she was “saved” and joined a religious group. Images of patient 1, a 40-year-old woman who experienced an acute severe headache while bending over in the shower. A, CT scan of a hemorrhage in the prepontine cistern (arrow). B, Sagittal T1-weighted MR image of the cervical spine shows a linear hematoma in the prepontine cistern (arrow). C, Anteroposterior-view angiograms of the right carotid (left), left carotid (middle), and right vertebral (right) arteries show severe vasospasm of the internal carotid, anterior cerebral, middle cerebral, basilar, and posterior cerebral arteries (arrows). A CT scan of the head showed nothing abnormal. A lumbar puncture was performed, and an examination of the CSF fluid showed xanthochromia. The results of MR imaging of the cervical spine were normal, but a small linear subacute hematoma was noted anterior to the pons (Fig 1B). 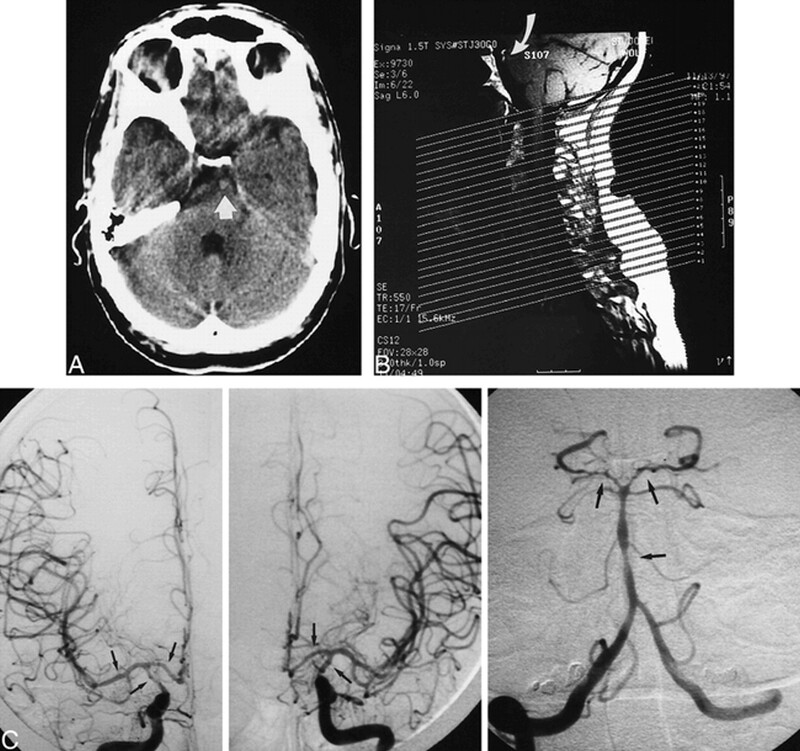 The next day, a cerebral angiogram showed changes consistent with diffuse and severe vasospasm, affecting both the anterior and the posterior circulation (Fig 1C), but no source of hemorrhage. The patient was treated with hypervolemia, and the administration of nimodipine was continued. The headache gradually resolved, and 7 days later, angiography showed complete resolution of the vasospasm, but again, no source of hemorrhage was revealed. The patient did well during 12 months of follow-up. A 67-year-old woman suffered a severe headache that developed over several minutes. She ignored the headache for 2 days. The headache persisted, and on the third day, the patient was seen in our emergency department. The results of a neurologic examination were normal. The patient's medical history was significant for hypertension and peripheral vascular disease. Three weeks previously, she had undergone an uneventful right carotid endarterectomy for asymptomatic carotid stenosis. A CT scan showed a small amount of SAH in the interpeduncular cistern. MR imaging confirmed these findings (Fig 2A). The next day, cerebral angiography showed nothing abnormal. The patient was treated with bed rest and nimodipine. One week later (Fig 2B), repeat cerebral angiography showed severe cerebral vasospasm of the anterior circulation and moderate vasospasm of the posterior circulation. Nine hours after completion of the angiography, the patient developed distinct anomia and paraphasic errors. The duration of her dysphasia was approximately 1 hour. She was treated with hypervolemia. Three days later, a transcranial Doppler examination of the anterior circulation revealed normalization of blood velocities. The patient was discharged in excellent condition. Images of patient 2, a 67-year-old woman who suffered a severe headache that developed over several minutes. A, CT scan shows a hemorrhage in the interpeduncular cistern (arrow). B, Anteroposterior-view angiograms of the right (left) and left (right) carotid arteries show to severe vasospasm of the internal carotid, anterior cerebral, and middle cerebral arteries (arrows). Cerebral vasospasm develops in approximately one half to two thirds of patients with aneurysmal SAH. Several studies have shown that the amount of blood in the subarachnoid space is the most important risk factor for the development of cerebral vasospasm (9–11). Nevertheless, there clearly are considerable differences in the response of different patients to equally severe hemorrhage. For example, severe cerebral vasospasm has been described in patients with intraventricular hemorrhages without any subarachnoid blood shown on the CT scan (12) and in patients with aneurysmal SAH who have only a very small clot in the subarachnoid space (13). Angiographic changes compatible with cerebral vasospasm are uncommon in patients with pretruncal nonaneurysmal SAH. In the largest series to date, a diagnosis of vasospasm was made in two (3%) of 65 patients (2). In other series, vasospasm has been diagnosed in up to 20% of patients (5, 14). These differences can be explained by timing and number of cerebral angiograms. In those patients with pretruncal nonaneurysmal SAH who do have angiographically shown changes compatible with vasospasm, the arterial narrowing generally is mild and focal, affecting the posterior circulation only (1–4, 6, 9, 14). Severe and diffuse vasospasm, as observed in our patients, has not been previously shown in patients with pretruncal nonaneurysmal SAH. Symptomatic cerebral vasospasm rarely, if ever, complicates pretruncal nonaneurysmal SAH. Rinkel et al (2), Canhao et al (1), and Van Calenbergh et al (5) each have described a patient with pretruncal nonaneurysmal SAH and angiographic changes compatible with vasospasm who developed symptoms of cerebral ischemia. In all three patients, however, the symptoms developed immediately after angiography was performed. Tatter et al (15) described a patient with a pretruncal nonaneurysmal SAH who did not have vasospasm but did develop a posterior circulation infarct after undergoing angiography. One of our patients with severe vasospasm developed symptoms of cerebral ischemia after undergoing angiography but not until 9 hours after the study had been completed. Her transient ischemic attack likely was because of vasospasm and was not a direct complication of angiography. The cause of pretruncal nonaneurysmal SAH has not been established, but a venous or capillary source, a ruptured perforating artery, and a low-flow vascular malformation have all been proposed (2, 4, 6–8) Whatever the cause(s) of pretruncal nonaneurysmal SAH may be, it is likely to be a low-pressure source, and aggressive hypervolemic hypertensive therapy is not contraindicated if symptomatic vasospasm occurs. Management should also include continuation of the administration of nimodipine. The presence of diffuse and severe vasospasm does not exclude a diagnosis of pretruncal nonaneursymal SAH. ↵1 Address reprint requests to Wouter I. Schievink, MD, Maxine Dunitz Neurosurgical Institute, Cedars-Sinai Medical Center, 8631 W. Third Street, Suite 800E, Los Angeles, CA 90048.